Set Includes: Set of (2) Two Decorative Throw Pillows. Beautiful brown white square shape decorative throw pillow set features cow pattern and graphic novelty design. 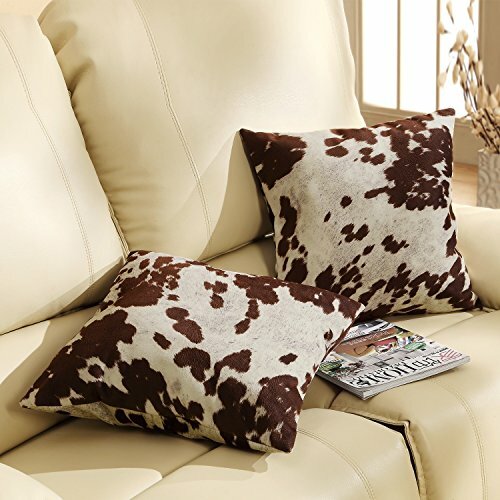 | Soft white and brown cowhide pattern is charming and cheerful. | Natural down and feather filling make the pillows comfortable enough to rest your head upon while you are watching your favorite TV show. | Removable cover with hidden zipper closure ensures great handiness and versatility. | High-quality 100-percent polyester cover and fill allow for quick dry spot cleaning.